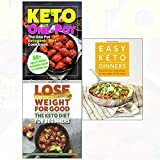 Easy keto dinners and diet for beginners and one pot ketogenic cookbook 3 books collection set Description: Lose Weight For Good: The Keto Diet for Beginners: Complete ketogenic guide to fast weight loss with low carb, high fat recipes: Based around the Keto Diet our recipes have been uniquely designed to help you manage your weight loss and maintain your goal weight, keeping you inspired and feeling energised each step of the way., The One Pot Ketogenic Diet Cookbook: Quick & Easy High Fat, Low Carb, Instant Pot, Slow Cooker, One Pot Ketogenic Diet For Beginners Cookbook For Fast Weight Loss: The combination of high protein, healthy fats and low carb vegetable ingredients mean meal times don’t get much heartier and simpler than one-pot keto meals. In every country and culture around the world there is a variation of the one-pot meal. In Spain – a paella, France – a boeuf bourguignon, a Moroccan tagine, Italian risotto or a classic Irish stew., Easy Keto Dinners: Modern life may be fast-paced and furious, but everyone needs a healthy and delicious home-cooked meal. From her hundreds of thousands of social media followers and website visitors, low carb food blogger Carolyn Ketchum hears the same question time and again: Is this recipe easy to make? 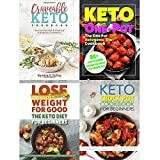 With this book, Carolyn invites readers into her kitchen, this time to deliver mouthwatering keto dinners that are quick and simple to prepare.